I helped to design, build and write content for CP-NETs Five-Year report. It was an excellent opportunity to practise and further develop my writing, editing and web-design skills. Check it out here. I recently spoke with What is Love? about dating and love, particularly as a woman with a disability. Give it a read here. I had the pleasure of attending the Brain-Child-Partners conference here in Toronto on Nov. 6-7 2017. I was there with CanChild, but was also representing the youth voice. The first session, Can We Fix the Brain? shared some fascinating and exciting therapies that help to rewire the brain and improve mobility. But it was the question posed in the title that really engaged the crowd, a question which quickly morphed into Should we fix kids with disabilities, and to what extend? Given this is likely a common question among parents of newly diagnosed children, many parents in attendance stepped up to the microphones to over their thoughts and experiences. Listening to the many opinions on this question, a theme became clear to me: We don’t need to be fixed; we need understanding and tools to help us achieve our potential and participate in society without stigma. BCP2017, my first such conference, was an excellent example of research and community uniting around a common interest and goal — patient engagement. But how to we achieve effective patient engagement that satisfies all parties? This was a question that received a lot of attention but lacked a clear answer. 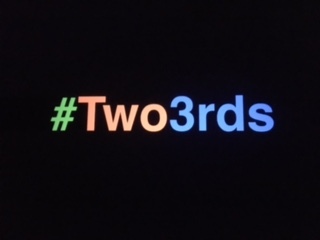 Several parents, both official presenters––including Rachel Martens, Julie Drury and Ann Douglas––and those in the audience, shared their experiences advocating for their children; what they’ve done, learned and need to change. I appreciate these stories more and more as I get older because they help me to better understand the challenges that my own parents faced and concurred in order to give me the best life possible. And it is by listening to these experiences that help researchers and clinicians understand what and how they can improve the lives of patients moving forward. I particularly loved what Louise Kinross, editor of BLOOM, had to say about clear and effective communication––if you want to know if parents understand your message, just ask. Louise also used one of my favourite quotes, from Albert Einstein, to illustrate her point: “If you can’t explain something simply, you don’t understand it well.” Those deep in the science often seem to lose sight of the fact that not all of us can, or care to, speak science. Though we greatly appreciate their work, it should be communicated in the language of those it is intended to help, otherwise it is almost entirely useless. As important as the parent voice is, so is the voice of the patient. Symon Hay captured the issue well when he said, “I think quality of life should be the root as individuals, health care practitioners, care givers and researchers.” He also spoke about how lucky he was to have had a doctor who put more stock into who Symon was as a person, than just his diagnoses alone. This enabled him to live a full and active life (We have a shared love of travel), when it seemed, on paper at least, that he shouldn’t. I couldn’t agree with Symon more. I was thrilled to be included with and meet the small group fellow youth with disabilities from across Canada at BCP2017. However, there should have been more of us. We should have been as considered and granted had as great a platform as parents. Many of us with disabilities wouldn’t be where we are today without our parents, research, medical advancements and early intervention. For this I am forever thankful to all those involved in my care and success. But it’s important to remember that we, the patients, lived it and are here to share our insights. This is especially important when discussing the transitions from childhood to adulthood, or youth engagement. If you want to know what we think or need, either for ourselves or future generations of children and youth with disabilities––as you should­­––ask us. 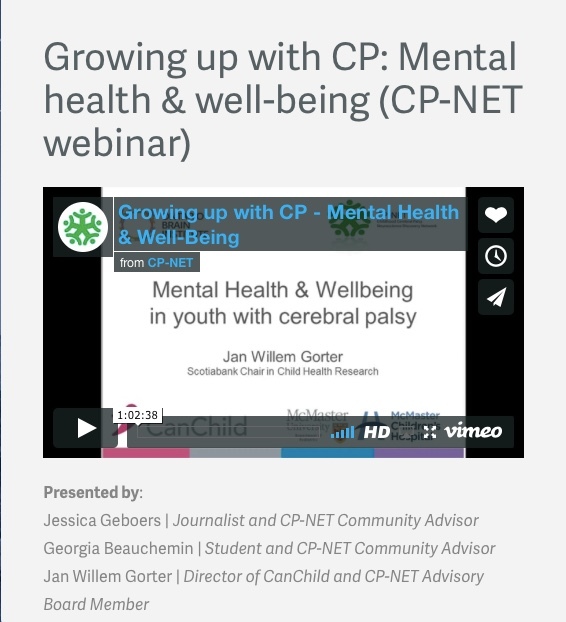 On April 21, I participated in a CP-Net youth webinar about the relationship between Cerebral Palsy and mental health. Give it a listen here. Scott & I are back! In this episode we discuss their experiences with Cerebral Palsy and try to figure out when C.P. Awareness Month actually is. We debate the potential need and reasons for a figurative holiday celebrating individuals with the diagnosis. Give it a listen here. I’m also participating in a free CP-NET webinar on Friday April 21 from 11:30 a.m.-12:30 p.m.: Growing Up with CP: Mental Health and Well-being. Please register, save the date and share with your network. See the event poster here.